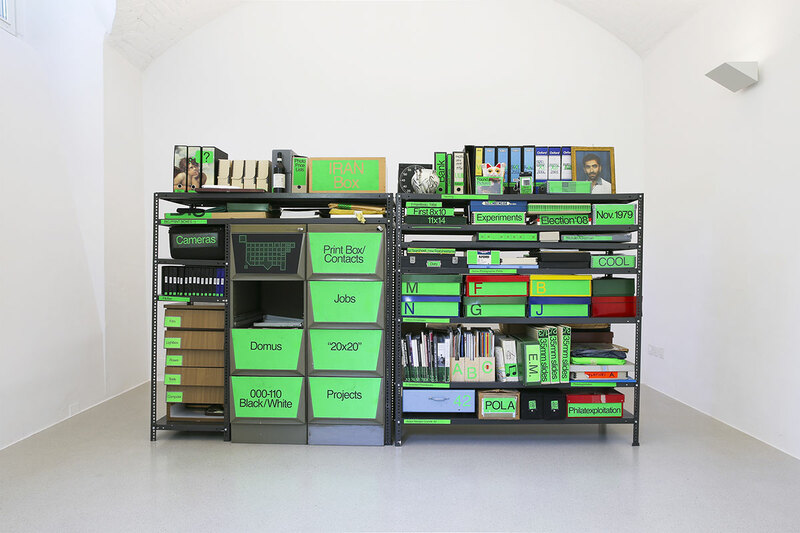 The physical archive, or as the artist would like to call it The "corpus mechanicum” -the metal shelves, the boxes, the graphics/typography and neon color signage- is an installation on view for a one year period at Viasaterna gallery in Milan. Although the artist now mostly resides in Southern California, he never doubted that the corpus mechanicum ought to remain in Milan. The inherent distinction between the corpus mechanicum and the corpus misticum continues to function as one of the defining points of tension in the interpretation of this archive. In considering Milan Unit as a mother ship or starter yeast (Lievito Madre) bits and pieces can be detached as source material. Upon activation, the contents trigger cell activity that can give birth to new readings, eventually redocking at the home station in post-mission repose. In “Archive Alive”, a diverse selection of content was culled from the archive and made available for consultation, examination and re-interpretation by the viewer and eventual workshop attendees. Archive Alive offers an opportunity not only to the attending public, but also to the artist in further interrogating the potential of work to evolve over time decoupled from original intent. The Archive of Fazel is a living organism less concerned with reproductions than with experience and interpretation. As a consequence of non-identical readings, Archive Alive finds location at the nexus between the physical and the cyber space. With Archive Alive, the living nature of the organism is underscored through a more critical examination of museological strategies that have underpinned the presentation of this archive in other host venues. Conceived around the turn of the millennium, during those watershed years that marked the rapid passage from the analog to the digital, in Fazel’s words, this archive embodies the will to “experiment with photography and find a way forward, exploring and preserving the material culture of a particular practice, on the cusp of an epochal change.” Milan Unit “is an attempt to collapse hierarchy, one that doesn’t make assumptions or assign value”, but rather represents the endeavour to respond to the crisis of meaning, offering itself up as a “survival strategy”. This response to the progressive advent of the digital era and its ensuing dematerialization of bodies in favour of the virtual dimension, is an impulse embedded within Milan Unit. Equally important to the actual space (for intellectual investigation) of pre-digital archives is the social and theoretical function of such spaces. The photographic camera is a social instrument; it obliges interaction and participation. The material culture surrounding the production and consumption of photography continues to alter societal norms demanding us to reconsider how we make, take and present photographic images. Rather than a “death of the author” moment, this proposal represents empowerment of the reader-viewer as coauthors in a pas de deux of inscription and resistance. Abadan, Iran, 1965. Lives and works in Claremont, California. Raised between Utah, Indiana and Tehran, he later moved to New York to study graphic design and photography. In 1994, he moved to Milan, Italy where he lived and collaborated in triadic fashion with magazines, designers, and industry. Working within, around and sometimes against the traditions of photography and installation, he has examined the idea of the individual as a reflection of place and an expression of influences. In 2008, Ramak exhibited his project “49 Capitols,” a photographic essay on his trip through 49 U.S. State Capitols, at Storefront for Art and Architecture in New York City. 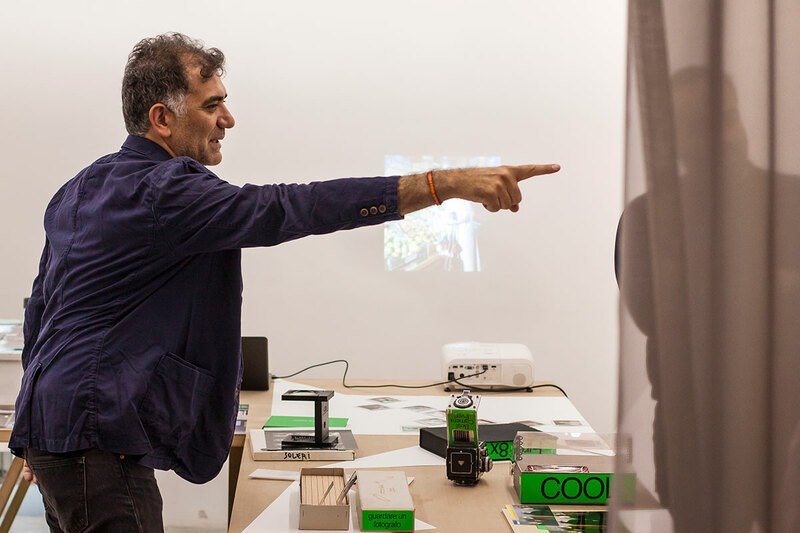 An installation of his ongoing project “The Business of People” was on exhibition at the Monditalia Section at the 14th International Architecture Exhibition la Biennale di Venezia in 2014. Ramak holds an MFA from CalArts and a BS in Mechanical Engineering from Purdue University. Currently, he’s visiting lecturer at San Francisco Art Institute. آرشیو Milan Unit مجموعه‌ای‌ست از عکس، نگاتیو، چاپ و اشیای روزمره‌ای که توسط فاضل در شهر میلان در فاصله‌ی سال‌های ۱۹۹۴ تا ۲۰۰۹ جمع‌آوری شده‌اند. آرشیو اصلی - یا آن‌چه فاضل بدنه‌ی مادی اثر Corpus mechanicum می‌نامد - متشکل از انواع جعبه‌ها، طبقه‌بندی‌های فلزی، طراحی‌های گرافیکی و کاغذهای نئون رنگ می‌باشد. این آرشیو قبل از این به صورت چیدمان در گالری Viasaterna میلان به مدت یک سال به نمایش گذاشته شده است. اگر چه فاضل هم‌اکنون در کالیفرنیای جنوبی اقامت دارد ولی به عقیده‌ی او این Corpus mechanicum اثر می‌باید در محل تولید و گردآوری‌اش – میلان - باقی بماند. اگر Milan Unit را ‘پایگاه اصلی’ بدانیم، اجزا و قطعات آن می‌توانند از بدنه‌ی مادی جدا شده و به عنوان ماده‌ی اصلی یک اثر هنری دیگر به شمار بیایند. تمایز بخشیدن میان بدنه‌ی مادی و غیرمادی Corpus Misticum این اثر هنری، نکته‌ی اصلی برای بازخوانی این آرشیو در مکان‌های مختلف است. آرشیو زنده، گزیده‌ای‌ست از آثاری که در Milan Unit وجود دارند و اکنون به مکان دیگری منتقل شده تا با تعامل و گفتگو میان بازدیدکنندگان نمایشگاه و در نهایت با برگزاری کارگاه شکل جدیدی به خود بگیرد. نمایشگاه و کارگاه ‘آرشیو زنده’ نه تنها به شرکت‌کنندگان بلکه برای هنرمند نیز موقعیتی فراهم خواهد آورد تا آثارش را در موقعیت جدیدی بازخوانی کند. در راستای همین خوانش جدید است که ‘آرشیو زنده’ مابین فضای حقیقی و مجازی بازتعریف خواهد شد. نگرشی که آرشیو را ارگانیزم زنده می شمارد، نگاهی انتقادی به خوان‌ش موزه‌وار از آرشیو خواهد داشت. آرشیو رامک فاضل در ابتدای هزاره‌ی جدید جمع‌آوری شده است، سال‌هایی که برای عکاسی نقطه‌ی عطفی محسوب می‌شدند و عکاسی دوران تحول بسیار سریعی از آنالوگ به دیجیتال را می‌پیمود. فاضل آرشیوش را تلاشی برای ‘یافتن تجارب جدید با عکاسی برای راه یافتن به آینده‌ی این رسانه در اوج این دوران کلیدی و از سوی دیگر حفظ و نگهداری از آن‌چه که در پیشینه‌ی این رسانه وجود داشته’ می شمارد. آرشیو رامک فاضل تلاشی است تا سلسله مراتب، ارزش‌گذاری‌ها و درجه‌بندی‌های مرسوم در آرشیو را از میان برداشته و از سوی دیگر به اجسام معنای جدید ببخشد؛ هم‌چنین خود را یک ‘استراتژی برای بقا’ می‌داند. به نوعی در بازخوانی آرشیو رامک فاضل، فضای حقیقی آرشیو - پیش از دیجیتال - به اندازه‌ی فضای مجازی ارزش داشته و سعی دارد تا عملکرد اجتماعی و تئوریک یک‌سانی را میان هر دو فضا برقرار کند. این نمایشگاه بیش از آن‌که به ‘مرگ مولف’ اشاره داشته باشد، پیشنهادی است برای قدرت بخشیدن به رابطه‌ی مشترک میان خواننده -بیننده به عنوان مولف. رامک فاضل متولد 1965 در آبادان است. او میان تهران و یوتا- ایندیانیا دوران کودکی خود را سپری کرد. سپس به نیویورک رفت تا تحصیلات‌ش را در زمینه‌ی گرافیک و عکاسی ادامه دهد. در سال ۱۹۹۴ در میلان سکونت یافت و در آن‌جا با مجلات مد، طراحی و صنعتی به همکاری پرداخت. او هم‌اکنون در کلرمونت – کالیفرنیا ساکن می‌باشد. گزارش تصویری رامک از سفرش به ۴۹ ایالت در آمریکا در سال ۲۰۰۸ در New york Storefront for Art and Architecture به نمایش درآمد. پروژه‌ی دنباله‌دار The Business of the People در چهاردهمین جشنواره بینال ونیز به تماشا گذاشته شد. رامک فارق‌التحصیل دانشگاه CalArts بوده و در حال حاضر در San Francisco Art Institute به تدریس مشغول است.